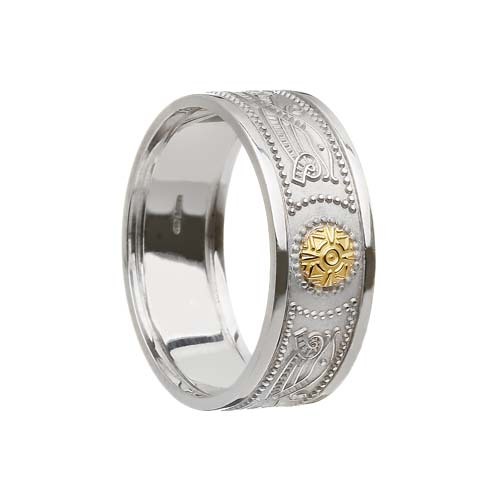 Boru has also added an oxidized finish to several of the sterling silver Celtic Warrior Shield Wedding Rings. Now three finishes are available, polished, Florentine and oxidized (blackened). The blackened oxidized finish is only available in the sterling silver or mixed metal (sterling silver and 10K gold) versions of the ring s in specific widths. Oxidized finish is not available with gold. The Celtic Warrior Shield range is made in Dublin Ireland by Boru Jewelry. The warrior shield range is available in a variety of widths with or without trim. The range is a flat profile ring and available in standard fit and comfort fit styles both styles have one shield and the serpent design goes all the way around the ring. and is available in sterling silver, mix of sterling silver and 10K, all 10K or all 14K Gold.